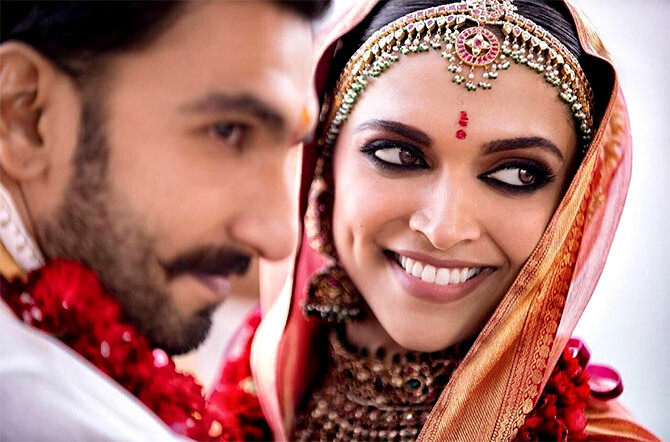 Rediff.com » Movies » DeepVeer Wedding: Which look gets YOUR vote? This is one fashionable couple you should take style inspiration from for your big day! The last two weeks have seen lovely pictures of Deepika Padukone and Ranveer Singh spill over into our lives. The newlyweds have raised the bar with their sense of style as they celebrated their wedding at numerous functions. Ranveer, known for his eccentric fashion sense, matched his footwear to some of his outfits! There's the big Bollywood reception coming up on December 1. But before that, here's a recap of all their wedding looks over the days. Vote for *your* favourite at the end! 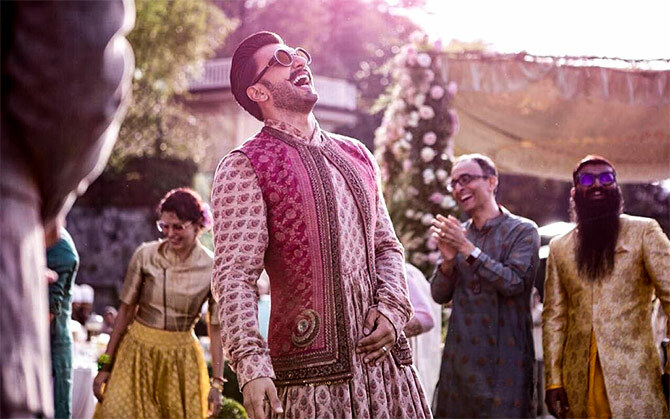 For her mehendi ceremony, Deepika wore a Sabyasachi pastel pink bandhgala kurta with intricate embroidery all over. She finished her look with a matching dupatta, red shawl, naulakha neck piece and heavy jhumkhas. Ranveer, on the other hand, kept his quirkiness intact by opting for an Anarkali teamed with a red jacket. Doesn't he remind you of his onscreen character Bajirao in this one? 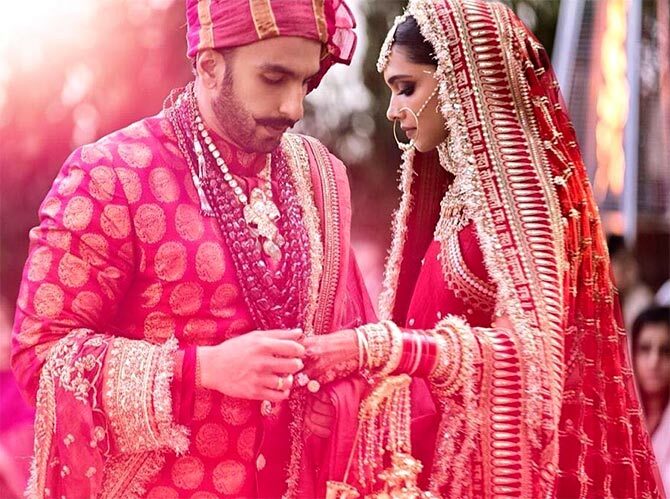 Deepika wore a red-and-gold silk sari with orange undertones for their wedding according to the Chitrapur Saraswat Brahmin tradition. The heavy jewellery was evident. 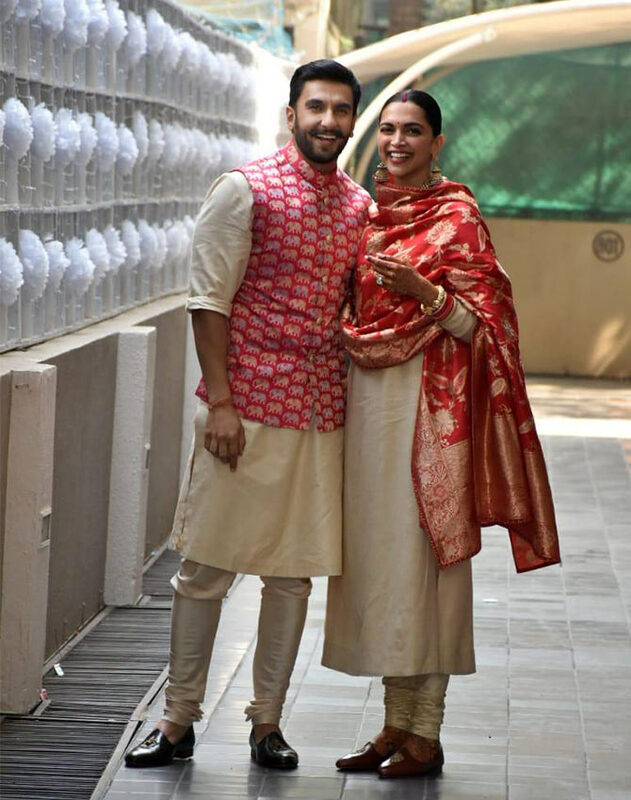 Ranveer kept his look simple, wearing a white dhoti-kurta with a bit of gold work in it. 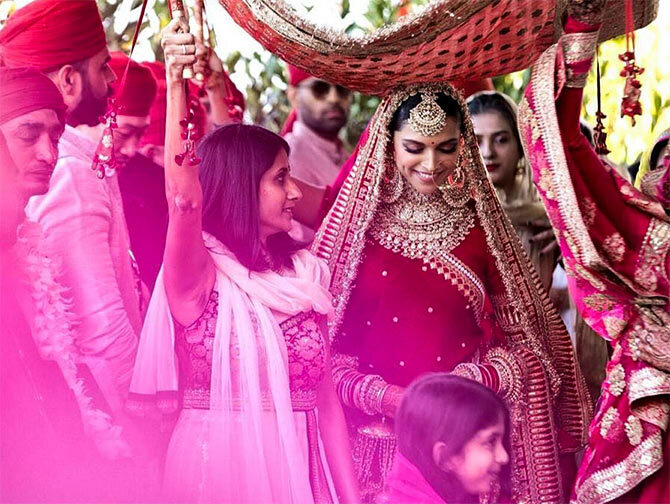 During her aamchi -- as Chitrapur Saraswat Brahmins like to refer to themselves -- wedding, the Piku star also wore a raw silk lehenga for one of the rituals. 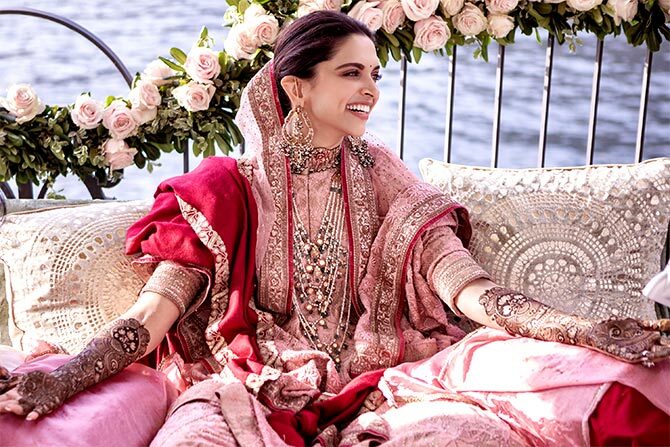 For the Anand Karaj ceremony, the bride wore a traditional red lehenga by Sabyasachi with heavy jewellery and minimal make-up. The groom colour-coordinated with his bride in a red bandhgala creation by Sabyasachi. 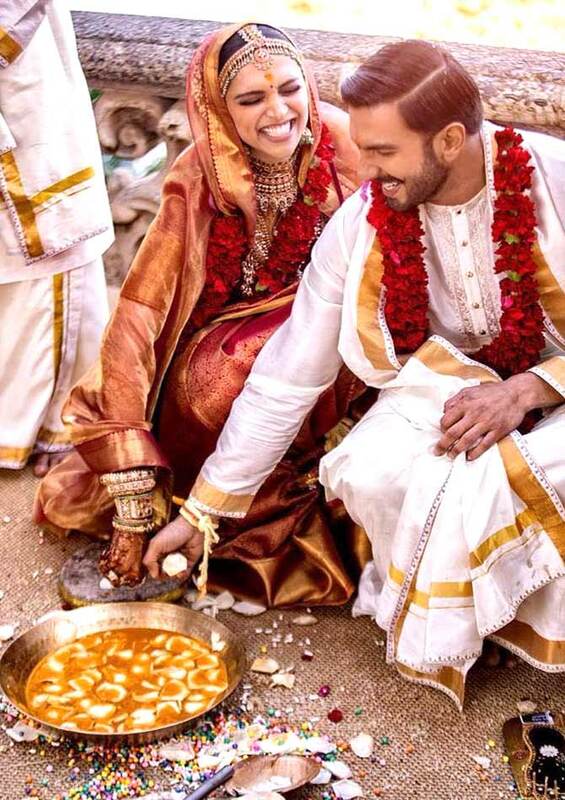 After their dreamy wedding in Italy, the couple flew back to Mumbai for griha pravesh ceremony. This time Dippy wore a gold salwar-suit with a red benarasi duppata whereas her hubby wore a subdued pink and red jacket. While heading to Bengaluru, Ranveer picked a white kurta-churidar paired with a floral design jacket. Dips chose a off-white Sabyasachi anarkali. At their Bengaluru reception, the bride and the groom wowed everyone again with their statement looks. Deepika wore a stunning gold sari from the house of Angadi Galleria whereas Ranveer looked dapper in a Rohit Bal creation. At sister Ritika Bhavnani's party in Mumbai, Ranveer was in his element in a colourful Manish Arora jacket over a long shirt and a pair of pants. Don't miss his quirky arm band! At their Mumbai reception, the two lovebirds twinned in white and gold outfits. Dippy looked like a million bucks in her ivory and gold chikankari ensemble designed by Abu Jani-Sandeep Khosla and her hubby looked sauvé in a Rohit Bal outfit once again. 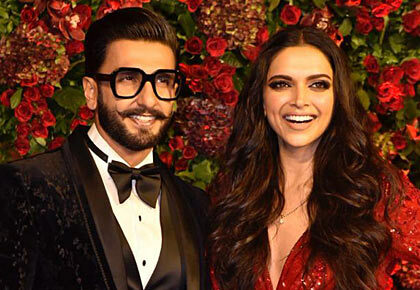 Deepika and Ranveer stepped out in their most glamorous look for the final Mumbai reception on December 1. Dips wore a Zuhair Murad gown while Ranveer opted for a Rohit Gandhi and Rahul Khanna tux.